Celebrating its 10 year Anniversary with its best programming to date, the Philadelphia Asian American Film Fest has commenced! This years slate is diverse in all aspects, bringing new venues (Fleisher Art Memorial ICA, Penn Museum, Reading Terminal), new formats (a theatrical reading and performance) and even repertory cinema (Anna May Wong retro) into the fold. There is no timidity here, with numerous documentary selections like Relocation Arkansas, The Chinese Exclusion Act and Resistance at Tule Lake, that piercingly highlight the enduring legacy of racism in America and set a deeper understanding of the very shape of our society and Constitution. There is also a kind of fairness in the programming, such as presenting films that express tragedy that befell the Japanese/Japanese Americans (And Then They Came For Us) and also tragedy that befell others at the hands of the Japanese (Finding Kukan). 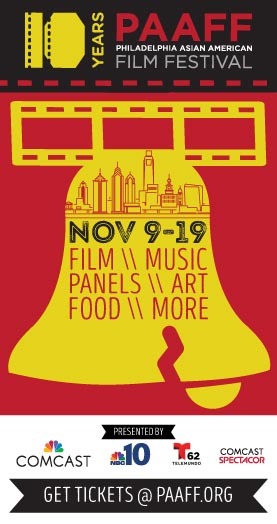 Programming runs through Sunday Nov 19th and will bring you to many corners of the city, which makes PAFF unique as something that engages the varied fabric of Philadelphia and taps into the site-specific potential of cinema presentation. With an exciting range of ideas, history and talent PAFF has, for this reviewer, evolved into a destination Film Fest! Check back for my Best-Of coverage as the festival progresses. Did I mention that almost a third of the programming is FREE? That is how PAFF shows its true nature, a desire to make this diverse and engaging programming accessible to all.